In this post, I’m gonna share my DIY experiment and how I styled it in two different ways. Since last year capes have been ruling the fashion world be it fashion shows or on red carpet…..it’s everywhere. I really love cape style dresses. They are comfortable as well as chic. Since a long time I was looking for a perfect cape. 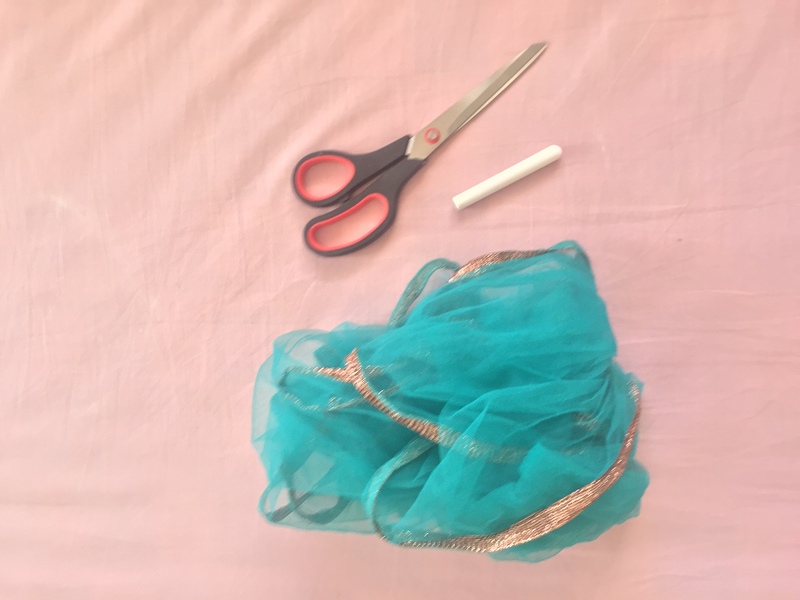 At that time some leftover tulle was just lying in my closet…..and I realised that I can easily make a cape using a piece of tulle. So I made this pink cape from leftover tulle and it turned out to be good. Trust me it’s always fun to wear outfits which are designed by yourself. 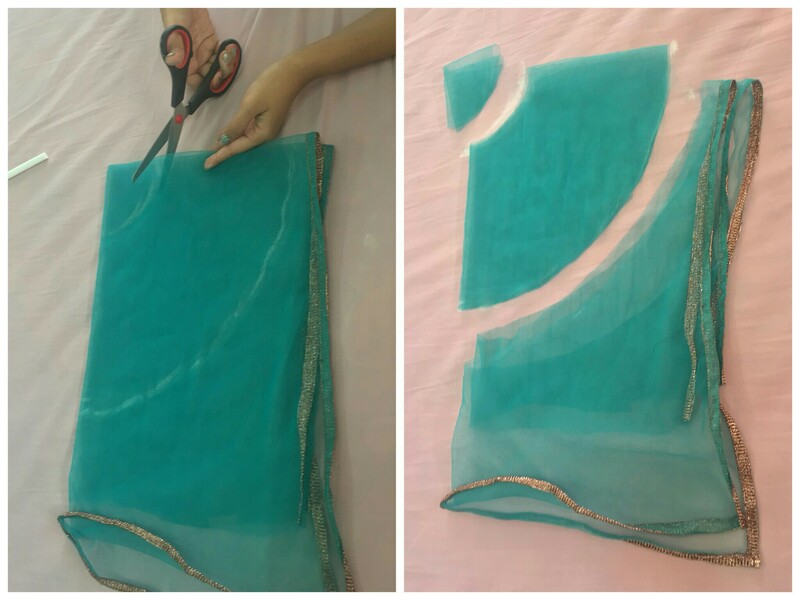 Follow the steps in following pictures for DIYing your no sew cape…..
Unfold the piece of tulle. 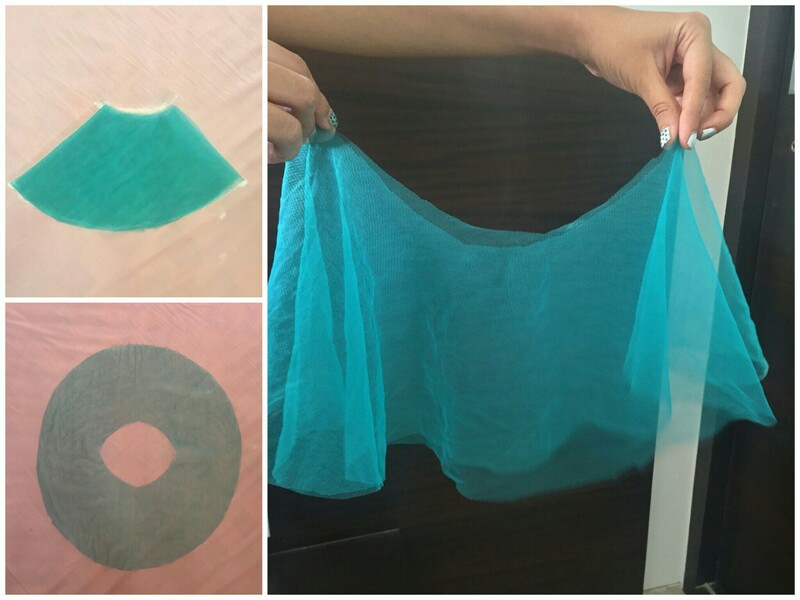 Keep it on the flat surface and fold it twice as shown in pictures. Take a chalk. Make equidistant dots on folded sides and join the dots as in the picture. Take scissors and cut as shown in picture. And your cape is ready. When you unfold, it looks round. You can now wear it as you want. 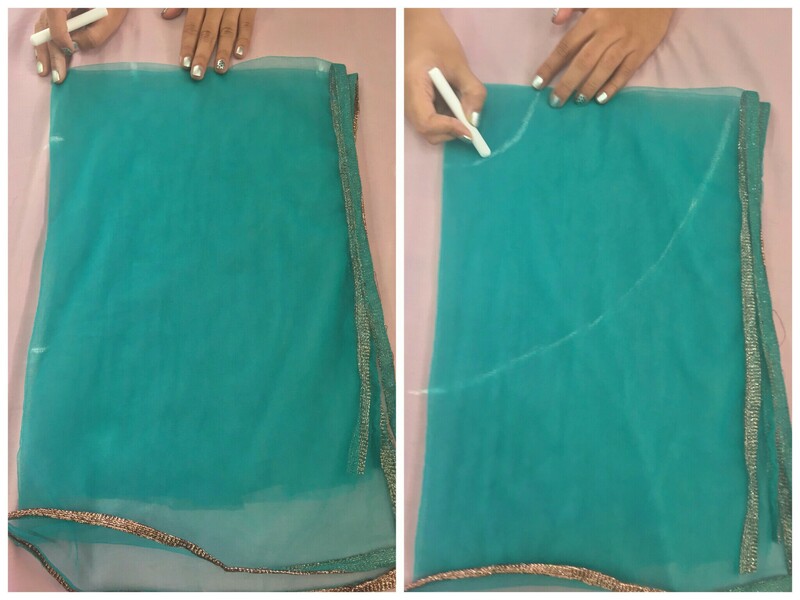 How I styled my tulle cape- I styled my cape in two different ways. Once with a long flared skirt and the other time with blue jeans. In both outfits I chose to wear pink tops coz pink tulle was looking perfect with pink tops than any other colours. When it comes to sheer clothes, I love layering them on same colour or may be darker shade of that colour rather than contrast colour. 1.Cape with skirt: This is an Indowestern look. I teamed up a cape with a flared blue ethnic skirt and a Forever 21 cropped top. 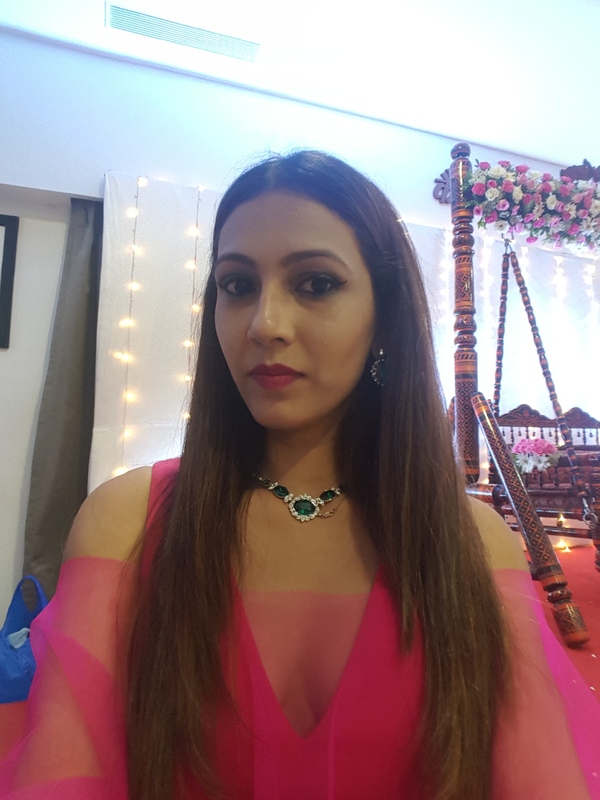 With this lovely fuschia pink and ink blue combination I wore green accessories (Swarovski earrings, necklace and bracelet) and a green velvet box clutch. I wore it for my cousin’s baby shower. 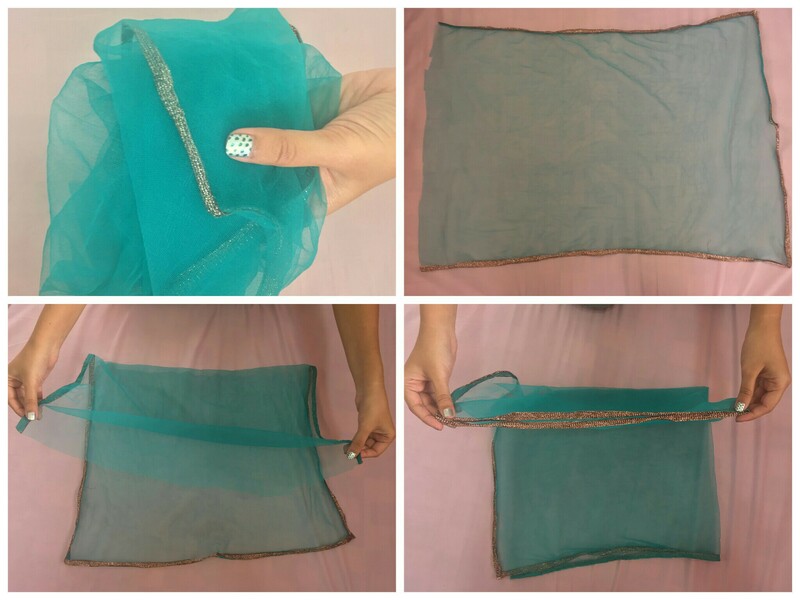 This is perfect for a sangeet, mehendi or even for indian festivals. 2.Cape with jeans: Here I wore a same cape in different style (on one shoulder) with a pink tube top from Only and Allen solly skinny jeans. Kept accessories to minimal with just Titan eye plus shades, silver loops, watch. Completed the look with a blue Tresmode sling bag and silver h&m shoes. This was my weekend look. This is perfect for hanging out with your girl gang or for a brunch. Previous postOutfit: Faux leather bustier with printed harem pants!!! Next postGrand canyon of Maharashtra- Nighoj potholes aka Ranjankhalge!! !